Summer has come and gone, at least as far as I’m concerned now that my yearly wine holiday with AdVintage Wine is over. For 2016 it was Croatia’s Dalmatian coastline as the destination, with a hotel base in Seget Donji (just east of Trogir and Split). Of course we had the usual free days where we were normal tourists, but for the sake of this site it is all about the wine! Croatia (Hrvatska) has a long wine history dating back to the Ancient Greeks and Romans, and is the ancestral home of Zinfandel, plus a host of barely pronounceable local varieties. Unfortunately it’s not always easy to get hold of its wines in the Northeast, apart from occasional bottles on the shelves of Marks & Spencer or via online retailers such as Pacta Connect and Croatian Fine Wines (Carruthers and Kent have been known to stock some as well, although not right now). As such it’s been over 5 years since I had a bottle of Croatian wine at home, so it was with no real knowledge or expectations that I tasted my way through the wines poured for us during the organised tastings and winery visits that covered 4 local areas within this central part of the Primorska Hrvatska (coastal Croatia) wine region. 1. Kaštela (expanded post here). The slopes at the bottom of the Mali Kozjak mountainside are the ancestral home of Crljenak Kaštelanski – aka Zinfandel/Primitivo – and both producers we visited are known for their work in resurrecting the grape more often associated with the U.S. and Italy. A morning visit was to Putalji in Kaštel Sućurac, with winemaker Anton Kovač in his newly built vineyard tasting area. 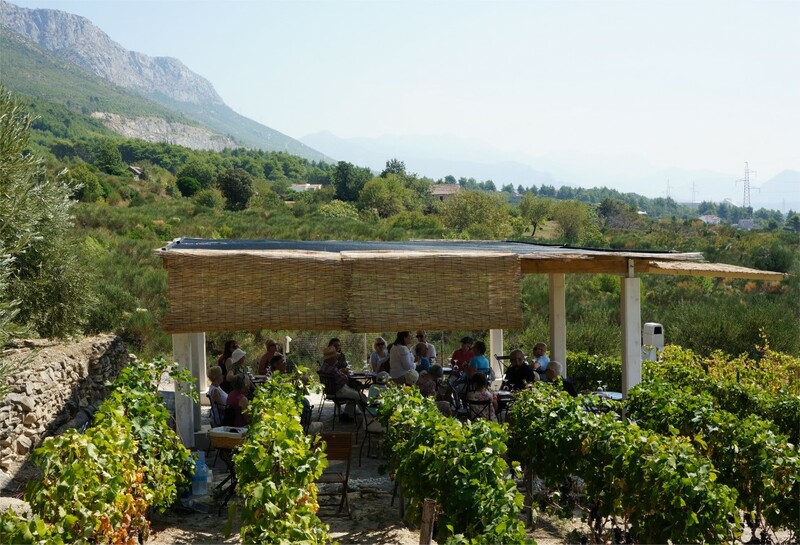 Under glorious sunshine, accompanied by cheese and olive oil, we tasted rosé and reds under glorious sunshine overlooking Split and the Adriatic below. The 2014 Plavac Mali was good enough to become the dinner table red on several nights over the week, while the 2014 Crljenak Kaštelanski was even better (so it came home with me!). Then to Vina Bedalov in Kaštel Kambelovac, where winemaker Jakša Bedalov and his family served us lunch and presented some of their wines. Local grilled vegetables, cheese and Croatian prosciutto (pršut) went perfectly with white, rosé and reds all from local varieties. Red: Crljenak Kaštelanski (Zinfandel), Plavac Mali, Dobričić. 2. Imotski (expanded post here). The Imotski area is inland close to the border with Bosnia Herzegovina and we first visted Podrumi Šimunović, where we were proffered morning Grappa (flavoured rocket-fuel by another name) whilst being serenaded by a guitar-wielding singer, before having the delightful Ella give us a description of the several wines we we tasting, comprising both local and international varieties. 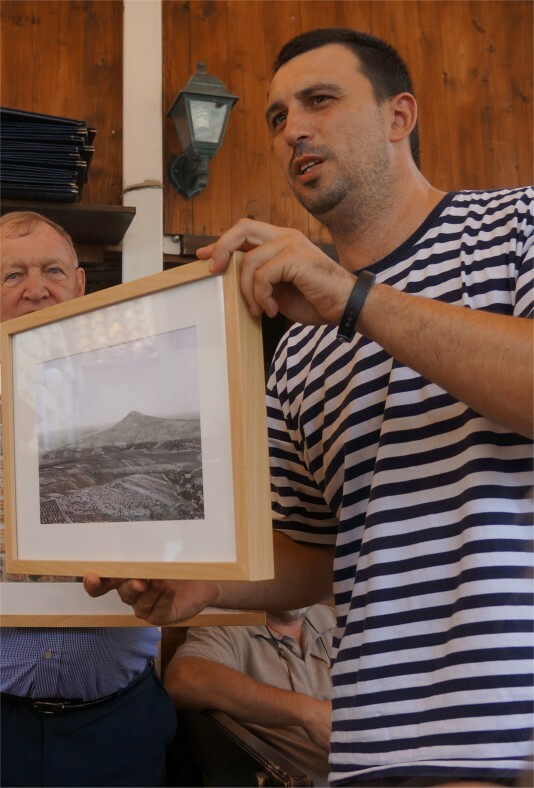 Then to lunch at Vina Grabovac and their new tasting room in the valley, which – for me at least – was the visit of the week, with Milan Grabovac showing us around the winemaking facilities and enthusiastically answering our questions on the winery, grapes and wines. Good wines helped a delicious meal go down, and some great wines resulted in me splitting a case to be shipped back to the UK! White: Kujundžuša, Chardonnay, Žilavka, Pošip, Sauvignon Blanc, Pinot Sivi (Gris). 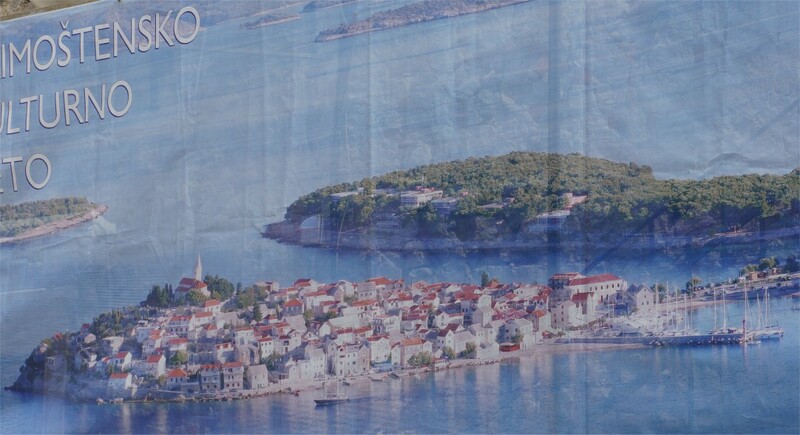 The coastal town of Primošten was built on an island now connected to the mainland by a causeway. 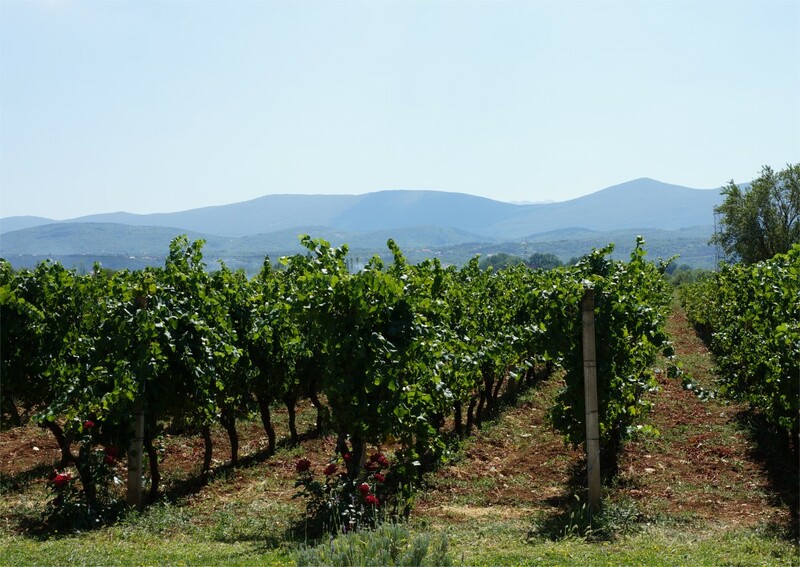 Part of the Sjeverna Dalmacija (Northen Dalmatia) wine region, it’s Bucavac Veliki vineyards are a designated Unesco World Heritage site planted with the red Babić variety. Due to harvest time and logistical issues we had lunch and a mixed tasting inside the town at Konobo Joso, an old winery now converted into a bar and restaurant. – Kontra, a blend of Babić (from Gracin, Primošten) & Dingač (Plavac Mali from Kiridžija, Pelješac); Dark, spicy and volatile with roasted flavours. 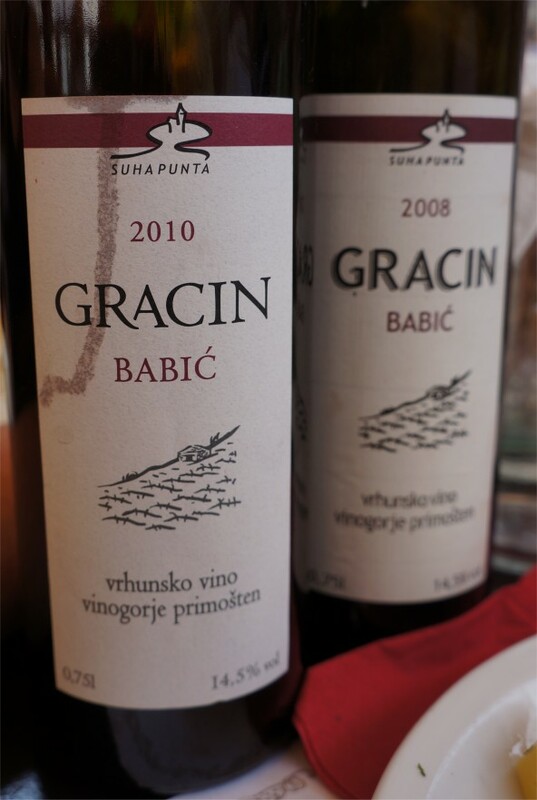 – Gracin 2010 Prošek, the famous Croatian sweet wine made from dried grapes (this one including red grapes) giving flavours of boozy raisin, alcohol infused cherries and caramelised Tart Tatin. 4. Plastovo, Skradin (expanded post here). Skradin is inland close to the hills, lakes and rivers of the Krka National Park which gives it a different microclimate to the coastal vineyards. 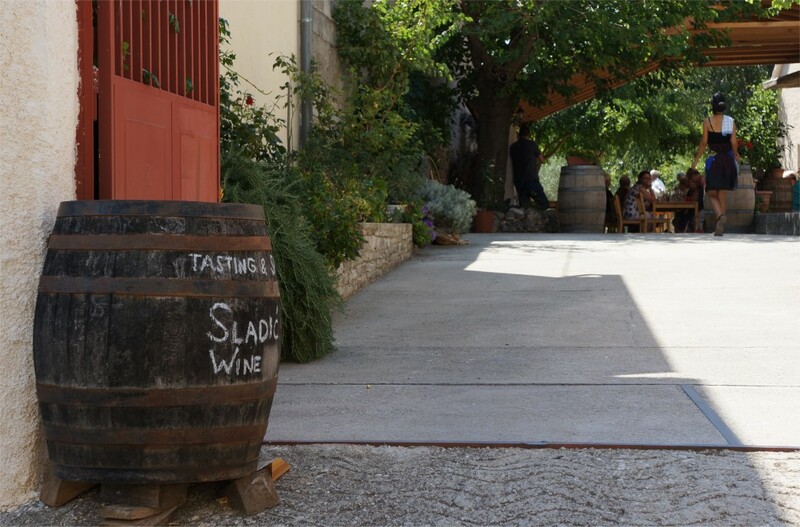 The small village of Plastovo is home to the Sladić winery, and Ante Sladić presented 2 whites and 2 reds from local varieties along with cheese, pršut and other snacks before finishing with some potent liqueurs. Sitting outside under the shade eating and drinking (sorry…tasting) made this feel the most intimate of the visits all week, but whether that was Ante and his hospitality or the fact that it was the last full day among friends is difficult to say. As always the time passed far too quickly, but I have the memories (aided by multiple notes and pictures!) 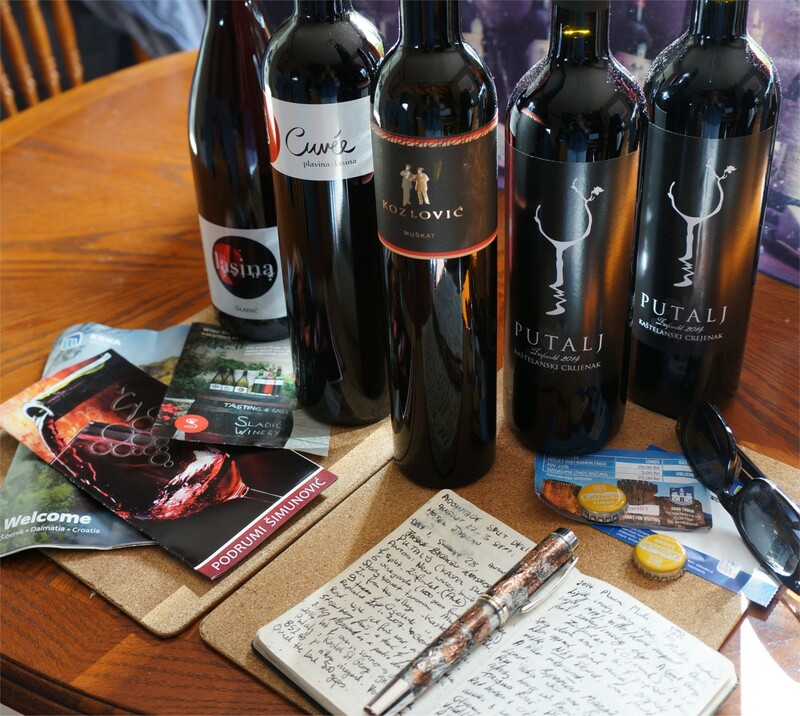 of fantastic weather and good wines – several bottles of which made it home with me (not including the Grabovac air-drop expected soon)! I also had the rather enjoyable company of the other holidaymakers on the AdVintage tour group; friends old and new who I hope to see again soon with a glass of wine in hand. 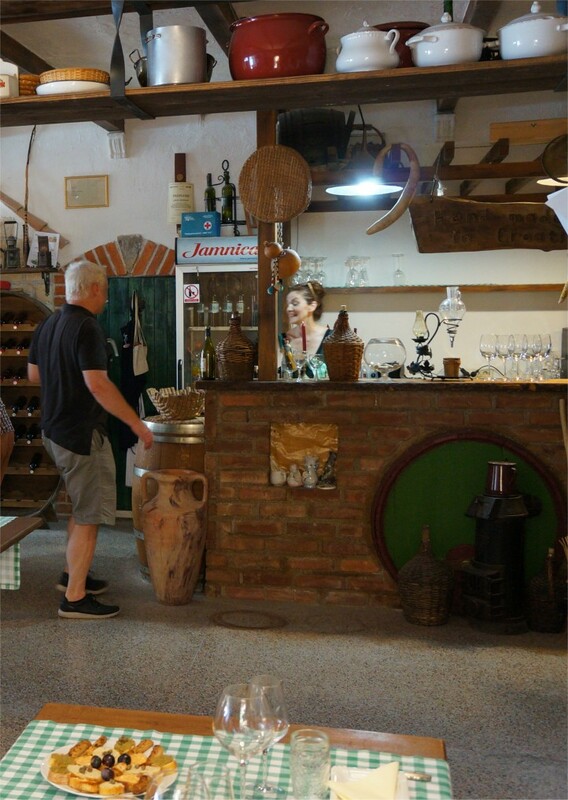 Special thanks go to Lee & Ian for sharing the wine buying/drinking, Lee again for our tourist expeditions; Lorraine, Linda and Janet for dinner conversations and, of course, Suzanne and Bill for organising yet another wonderful holiday. Slainte, or as they say in Croatia, Živjeli! !